You may have noticed this distinctive door in New Orleans. Found on the facades of beautiful homes, each door is like a warm invitation into a wonderful home. Stately, ornate and welcoming, the “New Orleans” style door is no stranger to admiration and praise. But what exactly defines it and what are some of the hidden benefits of this door? The “New Orleans” style door is characterized by its beveled glass. It’s what people are really thinking about when they see these doors up and down St. Charles Ave and the Garden District; beveled glass is inseparable from the New Orleans look and feel. The glass is made up of unique designs and patterns, which creates the effect of a prism. There is depth and a mesmerizing quality to beveled glass, and it gives off a luxurious and stylish feel that’s inimitable. Hand-cut glass with pristine designs and clean lines will be sure to wow any guest on your doorstep. It’s clear that the main draw of beveled glass is the beautiful design and workmanship. Each door can show off the unique personality of your home and is an individual work of art. With an array of designs, you will be able to find something to match your style with ease. Beveled glass carry with it the love and attention to detail of the craftsmen who worked on it, so having it adorn the facade of your home will definitely become a point of pride! Not only is it beautiful, it is also very useful and practical when it comes to energy efficiency. Living in this part of the world often means dealing with humid and sweltering weather. These doors are insulated to keep the heat out during warm and muggy days, keeping your home cool and transforming it into an oasis of calm. Our doors are also made out of mahogany wood, which is a beautifully durable and luxurious wood that can only be found in certain parts of the world. The wood boasts markings that are thin and fine and have little to no imperfections (such as holes). Furniture pieces made out of mahogany are elegant, durable, and look wonderful in homes, making it a very popular wood for artisans as well as decorators and homeowners. Come peruse our collection at Doors of Elegance in person or online– you will be guaranteed to fall in love with one (if not a few) beveled glass and mahogany doors. 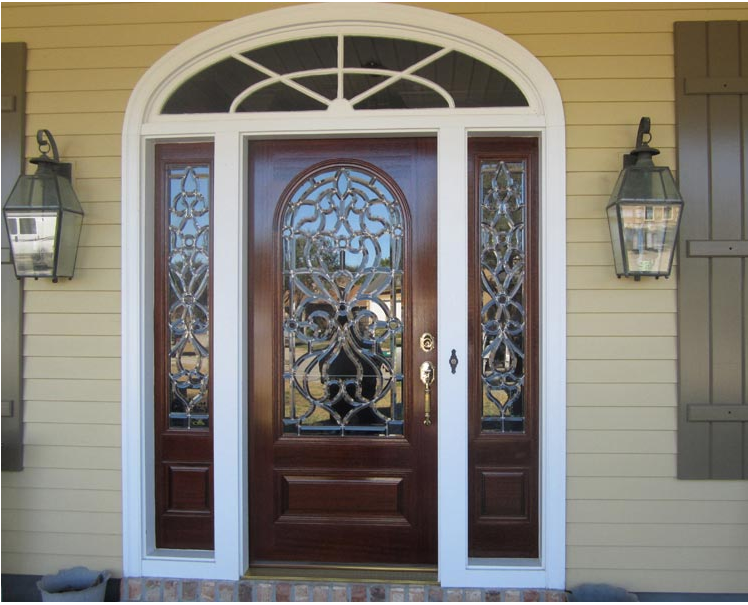 Contact us today to find out more and become a proud owner of a New Orleans style door!